*To register you will need to switch from your current GP practice. Once an application is made, a registration period will apply before you are able to access the service. Available for people living or working within 40 minutes of one of our clinic locations. An NHS GP practice that works around you. Our GPs are available 24 hours a day, 365 days a year. Every session is free, no matter how long the appointment lasts. We offer a full NHS GP service including digital appointments, physical appointments at one of our five locations, repeat prescriptions and specialist referrals. By registering, you will be switching from your current NHS practice to GP at hand. Increasingly impressed with @BabylonGPatHand from @babylonhealth! Lovely NHS GPs, quick service, and helpful clinical services team. A+! See a doctor quicker. Video appointments are available 24/7 on mobile or tablet and often within two hours of booking. Our NHS healthcare professionals prescribe medicines which you can collect from a local pharmacy of your choice, usually within the hour. 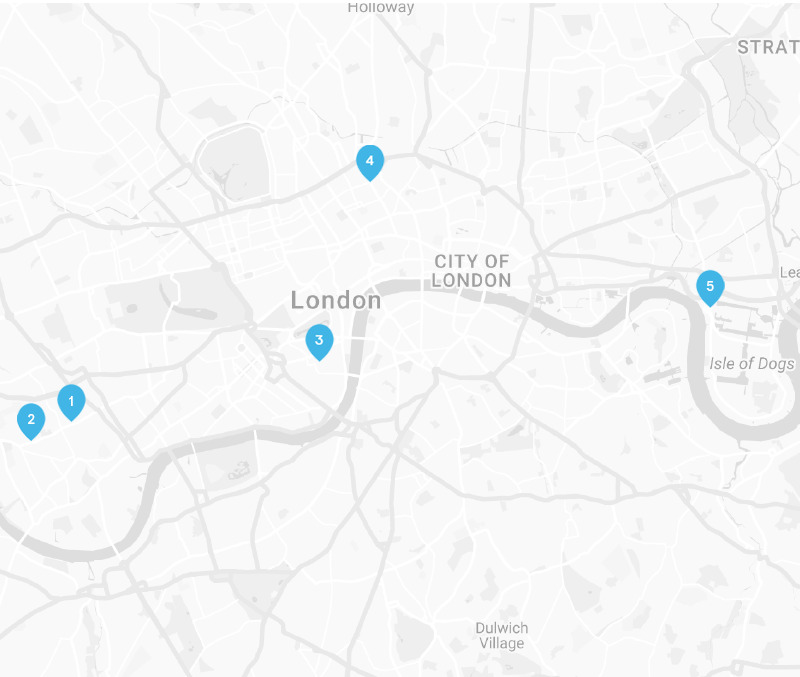 If you need to see a doctor in person, we have five clinics in London and you can visit the one most convenient for you. Healthcheck is a free information and educational tool to help you understand health risk factors, health profile, and lifestyle changes designed to help achieve a healthy lifestyle. Check your symptoms and get health information anytime using the symptom checker. Quickly view medical notes and replay a video of your appointment with records securely stored in your app. Babylon GP at hand is available to everyone who lives or works within 40 minutes of our 5 London clinics. We are a full NHS GP practice, with no restrictions on which groups of patients can register. We provide high quality NHS primary medical services for people of all ages, whether you are in good health or not. To learn more about registrations. To learn more about how we care for patients with complex health needs. Our clinicians are either GMC, NMC or GPHC registered and operate to the highest clinical standard. Just like any other NHS GP, our doctors can make referrals for hospital, community and specialist appointments. Our GPHC-registered clinical pharmacists can offer expert advice and prescribe medicines to help you feel better. Our doctors can also make referrals for nurse services, like blood tests, smears and travel clinics. Can't find what you're looking for? Search below or view all FAQs. Please make sure this service will suit your needs before registering. Click on the Switch now button at the top of the page and enter your postcode to see if you’re eligible and fill out the application form. We currently offer our service to people who live or work in zones 1 - 3 in London. It is a requirement of the NHS that you are only registered with one GP practice. This means that when you register with us, you will no longer be registered with your other practice. Why can I only be registered with one NHS GP practice? To ensure a complete medical history is available to the team providing your care the NHS only permits you to be registered with one GP practice at a time. This enables consistency and less disruption to care. When will I be registered? You can sign up in minutes and we aim to process registrations within two days. However, we have experienced a high volume of applications recently, so it could take up to a few weeks to register you and get your medical records transferred over. After you have submitted your application, please download the app and enable in-app notifications so we can notify you when your registration is complete. We will also send you an email to let you know we have received your application, and a welcome email once it has been processed. Once registered, you can book appointments in the app and use our full range of services. While you are waiting to be registered, you are still able to use your existing GP practice. Can I access my existing GP while I am waiting? Yes - you will remain registered with your existing GP until your application is processed. You can also use the symptom checker to check your symptoms. What happens to my NHS medical records? Your records will be securely transferred from your current GP to us. This will provide our doctors with your full medical history to ensure we are able to provide you with the highest quality of care. I had a technical error with my application. How do I arrange regular medication or repeat prescriptions? Once a medicine has been set up as a repeat prescription it can be requested via email on repeats.gpathand@nhs.net. Please specify full details of the medicine, your full name, date of birth and the collection pharmacy of your choice. Repeat prescriptions should be requested a minimum of three working days before required. Some prescriptions cannot be sent electronically and will be sent in the post, which means there may be a short delay. What if I want to return to my existing GP? If you want to return to your previous GP, you do not need to tell us. You only need to visit, call or email your previous practice and re-register with them. All our GPs are trained in antenatal assessments. We work together with your midwife and are happy to share care with the maternity unit of your choice. Antenatal care requires you to attend a number of face to face appointments, so it is important that you consider the need to travel to one of our Babylon GP at hand clinics when you make the decision about whether our service is right for you. Healthcheck is available free-of-charge to all Babylon GP at hand members. The information is sent directly to you and isn’t saved to your NHS health record. If you'd like to speak to one of our Babylon GP at hand doctors about any information you learn about from Healthcheck, they will be more than happy to assist. How is Babylon GP at hand related to the rest of the NHS service? We are a partner of the NHS and offer the same services as a traditional NHS GP practice. This includes digital and physical appointments, specialist referrals, mental health referrals, nurse appointments, women’s health advice, travel vaccinations, baby immunisations and family planning. How do I arrange a face-to-face appointment? We always ask you to complete a digital appointment first. If, after that, you need a face-to-face appointment, please call our support line. Can I see the same healthcare professional for every appointment? When you book a digital or physical appointment, you will be assigned a GMC registered, healthcare professional who will have access to your medical records and notes. If you want to see the same healthcare professional you saw for your last appointment, you can call our support line. Please be aware that not all doctors work every day, so you may need to wait for the appointment. Is there a travel clinic? We offer travel clinic services at our Babylon GP at hand Clinic, Lillie Road and The Medical Centre, Munster Road sites. Please make a GP appointment via the app and ask for a referral. Can I specify the gender of my healthcare professional? You can request to see a female or male doctor through our support line. At the time of booking your face-to-face appointment, you will be asked by our support staff if you would like a chaperone to be present or you can request that a chaperone is present. A chaperone could be suggested by our support staff if there is an intimate examination indicated. If a chaperone has been requested, but we do not have one available, we will give you an alternative appointment when we can ensure a chaperone will be present. All of our staff acting as chaperones have been trained to be chaperones and have undergone the required DBS checks. Can I request a chaperone? Yes, you can choose to have a chaperone present during your consultation when you book your appointment using the app. Alternatively, you can ask the clinic receptionist, nurse or doctor. If a chaperone isn’t available, you’ll be offered a new appointment time. Before intimate examinations or procedures, we will always offer you a chaperone to make you feel more at ease. What patient support is available? Our patient support team are available everyday between 8am -10pm. You can call us on 0330 808 2217 or email gpathand@nhs.net. How do I have an appointment using my mobile? Once you have downloaded the Babylon app on your mobile and logged in: Select Appointments from the home screen and choose when you would like to speak to a doctor (the closest time available will be shown but you can opt for a different time or day). Please choose between a video or phone appointment. You’ll have the option to add notes and a photo to your booking. This is useful if you would like your GP to know more about your condition before your appointment begins. When you're ready, tap confirm. The healthcare professional will call you at the start of the consultation so you don't have to wait around. Can I have an appointment on my desktop computer? Yes, to book an appointment on your desktop, sign into your account via the Babylon website. Go to ‘Book an Appointment’ at the top of the screen and choose when you would like to speak to a doctor. Please choose a video appointment and ensure you have a webcam connected. You’ll have the option to add notes and a photo to your booking. This is useful if you would like your GP to know more about your condition before your appointment begins. When you're ready, click confirm. Babylon’s AI services provide health information only, and do not provide a diagnosis. The AI services respond to the information entered, and the information provided is based on risk factors and statistics, rather than a personalised assessment. The AI services are not a substitute for a doctor, and should not be used in a medical emergency.